Service berry is known by at least 8 other common names, including shadbush, sugar plum, and Indian cherry. It has showy, white flowers and is among the first of Missouri's native plants to bloom in the spring. It's value to the ecosystem is quite high. At least 35 to 40 birds as well as a dozen mammals eat the fruit, which can be very sweet. 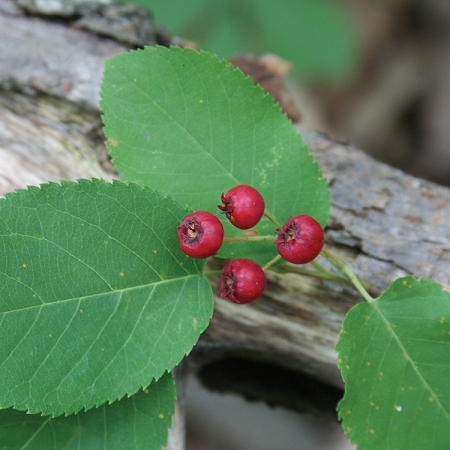 If you can beat the birds to the red fruits, service berries can be eaten raw or used in a variety of recipes. The flowers attract a variety of insects that are looking for nectar early in the year: honeybees, native bees, beetles and more. You can find the caterpillars of several species of moth and butterfly on service berry foliage, which will entice birds well after the fruit is gone. Q: How much will this tree cost when it is in stock--and when do you suppose you will have it? A: We probably won't have any until sometime in 2017. Those will be around $10 and maybe 1 to 2 feet tall. Q: Do I need both male and female plants to enable fruiting, and can you provide both, when in stock? A: No. Male and female flowers are produced on the same tree. You may have better pollination with more than one tree. Q: When will the service berry be available? A: We may not have any this year. We grew around 300 plugs last year to bump up into gallons this year, but rabbits ate them. We will still put them into gallons, but they grow slowly and probably won't be ready to sell this year. Q: Do you need more than one service berry plant to get fruit? Q: Will the trees survive being planted in the current weather conditions (high heat and humidity in early to mid June)? A: They may need a little watering here and there, but they will be better off planted in the ground than left in a pot.